I am thrilled to welcome D.J. Kirkby to The Nut Press today. D.J. 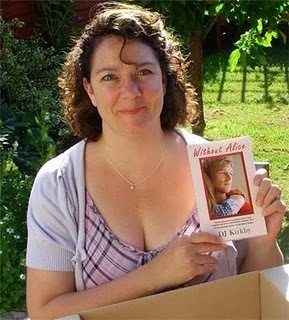 is here as part of a blog tour to promote her debut novel Without Alice. I was lucky enough to meet D.J. Kirkby at a book launch* in May. Since then, I’ve read D.J.’s first book, From Zaftig to Aspie, which is an incredible sensory memoir filled with beautiful descriptions from her extraordinary childhood. We’ll be meeting again at the beginning of October for another book launch in London and this time it’s for her debut novel, Without Alice. Before I even held a copy of the book in my hand, I wondered who the Alice of the title was and who the someone was that couldn’t be without her and why? Have you ever had a secret? One so important that it feels as if it will tear you in two? Stephen’s got one. He’s also got a great job, beautiful wife and an adorable son. Outwardly his life seems perfect but it means nothing without Alice. Read Without Alice and meet a man who you will love to hate until you learn to love him. Okay, so this establishes that it’s Stephen who can’t manage without Alice but it’s not giving much else away, is it? Especially not about who Alice is or why she’s so important to him. I absolutely had to know the answers but, when I started reading, it quickly became apparent that D.J. Kirkby wasn’t about to tell me anytime soon. The book starts with a prologue set in July 1977: three seemingly unconnected couples, one of them pregnant; one giving birth and the other ‘enjoying’ early parenthood. After reading it, I just had more questions: who are they? and what do they and their individual stories have to do with each other (if anything)? Within a very few pages, I put my initial queasiness and outstanding questions to one side. I was hooked, caught up in people’s lives and sucked into their story, as if I were in the same room and living through it with them in real time. D.J. Kirkby’s writing is extraordinary and dazzling. She works on every one of your senses: the world she creates feels so real that the characters are more like people you know whom you’re eavesdropping. D.J. does something remarkable in this, her debut novel. She makes her main character intensely unlikeable and sustains this for half the book. That’s difficult for a reader to cope with and potentially disastrous in the hands of the wrong author. But D.J. has a light touch and handles it deftly. I knew from the blurb that I wasn’t supposed to like Stephen initially (“meet a man who you will love to hate until…”) but I was surprised at how strongly I raged against him throughout Part One. But I didn’t throw the book at the wall or stop reading because, not only did I still want to know who Alice was and why she mattered so much to him, but I also had to know why he was behaving in this way to people I liked and sympathised with. There seemed no good reason for it. D.J. drops the reader hints and clues along the way but she doesn’t fully explain Stephen or his behaviour until Part Two. I had my theories as to what was behind it all and an idea as to who Alice was but I couldn’t put the book down until I had the answers. Then I had to keep reading to find out if and how it would all be resolved. Without Alice looks at the important relationships in our lives and raises questions about duty, loyalty and love within those same relationships. But, perhaps most interesting of all for this reader, the book forces you to look at how quickly and easily you can form an opinion or reach a conclusion about someone, not knowing all there is to know about them, only to have to later reassess it when you have more information available to you. Without Alice is an incredibly accomplished debut novel. It’s a story with many strands to it but somehow D.J.Kirkby threads them all seamlessly together to create an enthralling and credible whole. 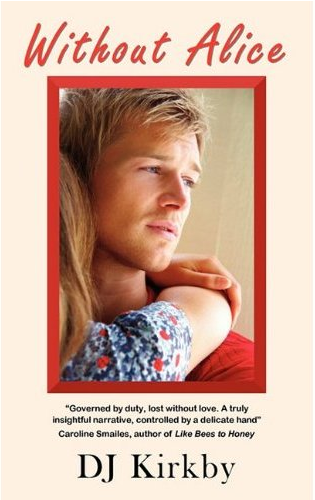 It is a harrowing story, beautifully told, and one which shows the redemptive power of love. She is a gifted storyteller, an exciting writer to watch, and I can’t wait to read what she does next. I have one copy of the book to give away (UK only). Just leave a ‘Pick Me’ comment below by Friday, 3rd September 2010. You can find details of more competitions to win a copy of Without Alice (one of which ends today and another tomorrow) here. Without Alice is published by Punked Books and is available exclusively from the Punked Books’ website before it goes on general sale on 4th October 2010, although you can also now buy it from amazon.co.uk. Watch the promotional video for Without Alice or join in the discussion on the Without Alice Facebook page. If you would like to know more about the author, D.J.Kirkby has a Website, and a Blog. You can also Follow D.J. Kirkby on Twitter. Thank you so much for this amazing review, and for not posting any spoilers. I’m looking forward to seeing you on Oct 4th. Good luck to everyone who enters the competition! It’s a pleasure having you here. Congratulations on the publication of Without Alice and I wish you every success with it. You certainly deserve that – it’s a brilliant book. What a great review. I have been itching to read ‘Without Alice’ since I first heard about it and would love you to ‘pick me’ for the free copy. DJ is one of those writers that grabs you on the first page. She definitely can tell an amazing story. I really enjoyed, “Without Alice”, even the part about really not liking Stephen! No one else would dare write such an initally unlikeable character and yet make you want to continue to read because you actually feel such passion for him and the others! Absolutely spot on! I would love to know what her secret for grabbing the reader is but I don’t think there is one. She’s a naturally gifted and very talented storyteller. Thank you, I’m glad to know you’re interested. Good luck! Thank you! Glad you enjoy my writing. I won’t be doing the draw but I wish you good luck! I already have a copy, but I just wanted to say it’s a great book! Thanks for the review, Kath. See you soon! I wasn’t sure if I needed a soothing bath or whether to go to the doctor’s for some special cream. Now I realise that I’m itching to read ‘Without Alice’. So please pick me for the free copy and put an end to this itching! Lol, what are you like? Good luck! I’d love to give you reasons to pick me, truth is I wouldn’t begrudge whoever is picked, from what I’ve been told by fellow students who’ve already read it, they’d be very lucky indeed. I can but dream. You want have time to read soon as you’ll be starting year three 🙂 I’m impressed that some students have read Without Alice already. I hope they don’t think it’s compulsary reading for the course! I hope you can make the book launch on the 20th Oct (details on my blog under the events tab). Looking forward to teaching your set during year three and good luck in this competition. Thank you for that lovely compliment Cindy! Please let me know what you thought of Without Alice when you do read it. Good luck with winning a copy here on Friday. I can’t be picked, but I’m intrigued by the book. Thanks for telling us about it! Sorry about that, Allison. I’ll look into worldwide postage for the next giveaway I run! The book is wonderful though – I can’t recommend it highly enough. My random generator, aka Squizzey, just put his paw in a hat and picked out Carleen’s name in the draw for a copy of Without Alice. Email me your address and I’ll post a copy out to you.